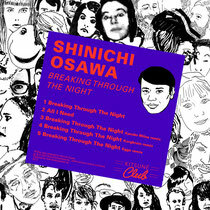 New Japanese talent, Shinichi Osawa, is apparently causing a stir over in Tokyo's clubland just now and has recently announced his debut double A side single, 'Breaking Through the Night / All I Need', via Kitsuné this spring. Fresh from his recent collaboration with Parisian stars, BeatauCue on their 'Falcon Punch' EP and a bunch of remixes for Etienne de Crecy, Digitalism and Boys Noize, the time has arrived for Shinchi Osawa to launch his release on the Franco-Japanese label. 'Breaking Through the Night' is cheeky disco-tech oddity, full of aural pleasing surprises. The second track, 'All I Need', is a creeping electro-house monster that may well devour dancefloors this season.The EP also features three remixes: Xander Milne offers a very punchy one for starters, then comes French producer Korgbrain's remix which brings a deep and minimal touch to the track, finally another French rising producer, Eggo, signs off with a smooth but groovy version. check it out below, it’s out 7 April.